In our book, the Museum of Natural History can do no wrong. And they score again with their new iPhone app AMNH Explorer that uses GPS to help you navigate the sometimes confusing twists and turns of its 500,000 square feet of public space. 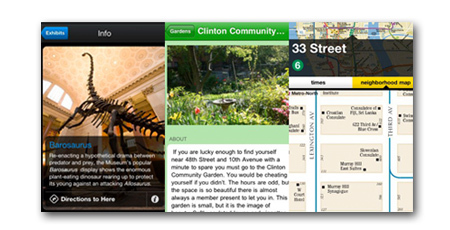 In addition, the app includes info on many of the key assets of the museum. You can download the free app here or borrow one of the 350 devices the museum now has on hand, preloaded with the Explorer, at no charge. Bully! Green Sky Designs, a landscape design firm based in Brooklyn, has created GardenSpace NYC with the purpose of "strengthening relationships between New Yorkers and their urban ecosystem," according to the firm's principal Kate Belski. Specifically, you get a guide, sorted by neighborhood, to large parks and small community gardens, each with a thoughtful essay and rundown of the facilities. So far, it's Manhattan only, though they plan to expand to the rest of the city. It's $1.99, buy here. NYC Mate covers ground that a number of other apps have addressed, such as subway and bus maps, but with a couple of twists. The helpful one is a neighborhood map connected to each subway stop. The less helpful one is the official schedule of 'departure' times for every train at every station. That's a nice thought, unless you've ever taken the subway before. No complaints, though, since the app is free. Get it here.